Your dog is not a verbal creature! We have a tendency to talk, talk, talk to our dogs, but dogs don’t sit across from each other…and talk. Dogs communicate in many other ways, and if we connect to the “animal” part of ourselves, we can actually communicate with our dogs quite naturally, without words. What are some ways that dogs “talk”? Dogs are physical communicators. They use their bodies, their energy, and their action to convey their message. The world of dog body language is very complex, and very simple at the same time. Body language can feel complex in the sense that you can often look at individual body parts to determine how a dog is feeling. Ears forward? Mouth tight? Tail erect? Hard eyes? Sounds tense! What about yawning? Or shaking off? Or a ‘tongue flicker’? These are all forms of non-verbal communication. Yawning tells us your dog is working, trying to figure something out or is stressed. Shaking off is a literal release of tension. You know the expression “shake it off”? Dogs are literally shaking tension off. And then tongue flicker, when your dog flicks her tongue at you, that’s a sign of submission or an appeasing behavior. 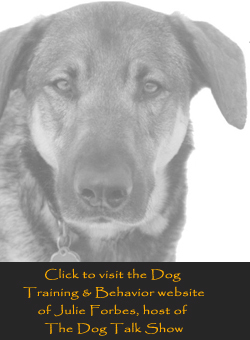 We can simplify the conversation of non-verbal communication and read dogs by paying attention to how we feel. If a dog is displaying all the above signs of tension, then you can probably also feel that tension, in addition to hopefully recognizing specific signals. We respond intuitively, as animals, to other animals… we humans just don’t often “listen” in that way. Slow down, get present, and tap-in to how you feel, because this is a powerful tool in helping you understand your dog. Make sure that your body language lines up with what your intention is, as well. Let’s take the behavior of jumping up, as an example. When your dog jumps up on you, what do you do? If you want to communicate to your dog that you don’t want them to jump on you, how can you do that effectively? This is a time when people often focus on the words and not the action. You might be saying, “OFF!” and feeling that you don’t want your dog to jump on you, but if you are also stepping back or shrinking away, then your body is not matching your words. And remember, the dog’s language is everything BUT the words! If you want to convince your dog that they should not jump on you (which in the dog world, is disrespectful), then you need to assert yourself. If you can read your dog by connecting to how they feel, then your dog can read you the same way! Rather than stepping back or turning away, step toward your dog in a way that makes a statement. Tell her with your body: “Don’t invade my space” by shuffling your feet abruptly into her space, back her up, and then when she is off of you, praise her for “Good Off” or “Good Sit”, so that you are reinforcing the good, as well as communicating where the wrong choice is. As you do this, emit a strong presence, but be careful that you aren’t angry. Stay calm, but let your pup know that she is not to invade your space like that. Then, when she offers another behavior that keeps all four paws on the ground, praise her for it! 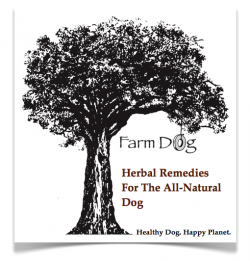 If your dog’s environment, i.e. you, consistently negates the undesirable behaviors and reinforces the desirable behaviors, then you will see less of the undesirable and more of the desirable. You have to be consistent. Your dog’s behavior will mirror your consistency, so just be responsible for that. 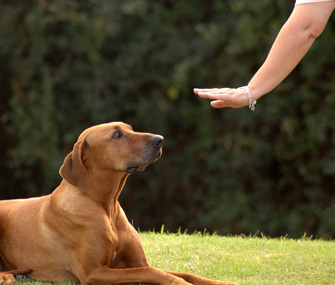 Don’t get mad at your dog for not listening if you only follow through half the time! Why should she listen if you don’t stick with it? Remember, actions speak much louder than words. Dogs can certainly learn many words, but word are not their language. To clearly communicate with your dog, speak your dog’s native tongue, which has little to do with your tongue, at all.